First-time buyers under the age of 40 in England can now register to buy new homes at a discount of up to 20% off the normal price. The offer is part of the government's new "starter homes" scheme to encourage home ownership and construction on previously used "brownfield" land. 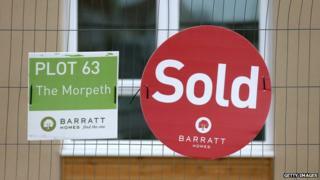 The government hopes 100,000 new houses will be built specifically for first-time buyers by 2020. Labour said the plans would ring hollow for those priced out of the market. The 20% discount is achieved by waiving local authority fees for homebuilders of at least £45,000 per dwelling on brownfield sites. The government said there would be no compromise on quality or energy efficiency, but first-time buyers would have to repay the 20% price advantage if they sold within five years. Media captionHousing minister Brandon Lewis: "It opens up an ability to own a home to a whole new group of people"
Housing minister Brandon Lewis urged first-time buyers to register on the starter homes website from Saturday. He said an affordable house-building programme was beginning which had "the fastest build rate in about 20 years". "And this new starter homes programme is another 100,000 homes on top of everything else that we're doing, allowing those first time buyers, people who want to own that home of their own, to be able to do that - a good design, well-built home, with a 20% discount. "When you link that with Help to Buy it opens up the ability to own a home to a whole new group of people." But Labour said the government had presided over the lowest levels of house building since the 1920s and home ownership was at its lowest level for three decades. The number of houses being built in the UK fell during the final three months of 2014 - the first such decline for almost two years. The 0.2% drop in new home construction compared with a 6.1% increase in the previous quarter. Overall, total construction output fell by 2.1% in the quarter, the Office for National Statistics said. However, the government says 137,000 homes were started in 2014 - a rise of 10% on the previous year. The government introduced a scheme called Help to Buy in England in April 2013. It was intended to help those trying to get on the housing ladder who could afford mortgage repayments but were struggling to raise a deposit. Last March the scheme in England was extended until 2020 rather than December 2016, as had previously been planned.